It’s Spotlight Saturday and we would like you to meet Joanie Buchanan, the trusted Central Supply and Accounts Payable Director at Westgate Hills. 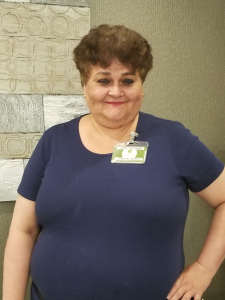 Joanie has held this position at our facility since June of 2014 and has been working with the elderly population since 1974. Apart from her regular job duties, Joanie is a compassionate friend to each of our residents. She will often run errands, play board games and converse with the residents in her spare time – that’s just the loving and kind person she is. She is also often front and center at the resident karaoke and dance entertainment events; anything to make a resident smile. Joanie tells us that her proudest moment at Westgate Hills was being named Employee of the Month in April 2016. She loves the way that the corporation here at Westgate are so supportive of the residents and staff. A loyal sports fan, Joanie’s favorite outing is to a Baltimore Raven’s game. Originally from Laurinburg, North Carolina, as Joanie puts it, she’s a true “Tar Heel”! To see our current career opportunities, and become part of the Westgate Hills team, please visit our Careers Page.